With the not so great (okay, terrible) stage fighting aside, I generally enjoyed the first episode of the new show. I never had an opportunity to re-watch the three movies, but the show felt as much like the franchise that I recalled. For a few scenes, I had a strong feeling that Noah Wyle was channeling the 10th Doctor and the show Dr. Who, complete with Converse sneakers and references to pocket dimensions. Rebecca Romijn, who I've never been a super big fan of, was fine in her role as guardian/protector of the Librarian. As usual, never enough Bob Newhart or Jane Curtin, and it seems, we won't be seeing too much of them in the series, itself. This is definitely one of those shows where you have to hold in your protestations of "That place doesn't look anything like that!" and just enjoy the fun and good natured attempt to find the next closest thing. With regard to how the show treats history, it's very similar to Sleepy Hollow. It throws out facts or places that are real, but then just totally spins with them. Granted, Librarians has a sentient flying sword versus Sleepy Hollow having a witch who can talk to birds. I'm already heavily biased toward Christian Kane's character, but the other two potential librarians weren't terrible in the least. Does the other guy have a British accent? It seemed to come and go as it pleased. The Librarians are definitely lucky that the bad guys have apparently resolved to never use guns, it's steel blade or nothing, yo! In general, yeah, the show is much better off staying away from fighting scenes, be it the sword fighting to the punches that missed by several inches which took people tot he ground. I would say this is the one real weakness of this episode. Argh. I would have liked to have seen the Librarians' deft analysis of the painting had more of an impact on giving them the edge over the bad guys, who instead of pursuing the wrong course of action, were allowed to simply follow them. Doh. I did not see the double cross coming at the end. Congrats, writers, you got me. By the way, IT'S A MAGICAL WOUND. P.S. "Dracula isn't real.....BECAUSE I KILLED HIM." Nice call back to one of the earlier films, heh. Having been a Leverage watcher I was inclined to check out this series because of the Devlin connection. I had this vague plan to check out the movies in the six months between hearing about the series and now and, um, not so much. I assume that's not all that important, though the description that emerged for this episode - potential librarians? Like they're Highlanders? - confuses me somewhat. Somehow I goofed programming the DVR so now I need to wait for it to show up on their site or re-air. If you're familiar with Buffy the Vampire Slayer, it's exactly like that (until the very last episode), in which you can have any number of potential slayers, but there's only one slayer until she's kaput and a new slayer is chosen. If you're not familiar (check it out! ), basically, as established in the very first movie, there's ever just one Librarian, and when that Librarian is killed/dies, the Library essentially chooses a new one from any number of potential candidates. Rinse, er, die and repeat. Does the position actually bequeath the Librarian with any extra magical powers or strengths? I don't think or recall that it does, it simply puts the individual in the position to live a life of research, adventure, and stopping people from doing evil things with historical artifacts, typical librarian stuff. Another perspective, imagine it as James Bond, and while there's plenty of actor candidates to play Bond, only one will play Bond, until that actor moves on. That's a really weird comparison, actually, but I think it works! I wanted to like this show. Quirky ensemble cast who master dangerous situations with brainpower? Yes. Instead what I got was a trainwreck. Sad, wooden fight scenes - especially the Guardian who was chosen entirely for her looks because it went against type except they forgot that for that to work you need someone who can make the physicality believable. Maybe they could bring in Christopher Walken to teach them all some swordplay. And I really like Matt Frewer; between Max Headroom & Orphan Black he rates a pass on just about anything but wow was that a sucky British accent. Sorry, not gonna waste my time on it. The showrunner had a reddit ama worth a glance. I read this thread before playing the eps off my DVR and tempered my expectations accordingly, and even so I was a little disappointed. 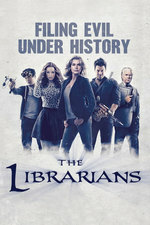 I haven't seen the Librarian movies but I'm a die-hard Leverage fan and my husband is a devotee of Warehouse 13, Stargate, and similar shows, so we were both hopeful. I'll give it a little more time, but wow. I don't watch Dr. Who because every time I tried, I bounced off the hammy acting, and this show was trying so hard to embrace the ham that I kept wincing. I know some of these people are good actors but you wouldn't have known it. And the fight staging was so so so bad, and if I'm going to buy Rebecca Romjin as the muscle I'm going to have to buy her physicality a little more. She looks the part - she can look imposing - but she doesn't sell the fight scenes very well. When you have Christian Kane on-board, I keep thinking about how much better things could be. And oy, the swordfighting with the...I can't. I just can't. So, uh, I hope for things to improve, because I want very much to love this show but at the moment it's not doing anything for me. Darn. I was hoping that Devlin would be involved in Librarians to the same extent as he was with Leverage, but I guess as the creator of the franchise he's going to be more hands-on. I'll have to see if lowered expectations can improve the next episode. I'm going to put this here since the first episode seems like the place to link it - John Rogers talks about how he came to be involved with the show, deciding on the content, casting, etc. Spoilers abound for ep1&2. Yeah, he also did a good interview in this afterbuzz podcast. I was pretty underwhelmed with this series at the start, but I've been won over by episodes 4 & 5, so I'm delighted that Rogers is back to doing post-show blogging. So this is on Hulu now. I really like Christian Kane, as always. I am also liking Cassandra the mathematician, but I think I like sci-fi nerdy redheads in general. Rebecca Romjin is fine so far. I'm not that interested in the other dude.